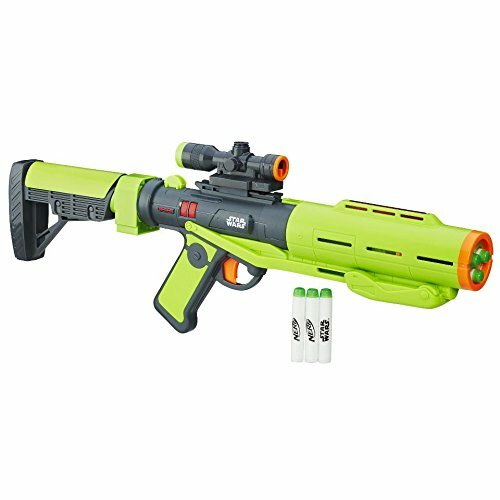 Finding the best Nerf guns for kids can be challenging since there are so many different series available. Children also love to form their own playing styles, which means it’s crucial that you find the best blaster that fits their size and age. Little kids enjoy small Nerf guns like hand and miniguns since they are easier for them to handle. While older boys and teens like the big Nerf guns, including automatic ones like Nerf machine guns. If you’ve been having a hard time trying to find the one that your kids will enjoy most, you’ll be pleased to hear that you can find just what you’re looking for in this review! There’s also a detailed buying guide at the end to help you if you’re still unsure about which one is best for your boy or girl. 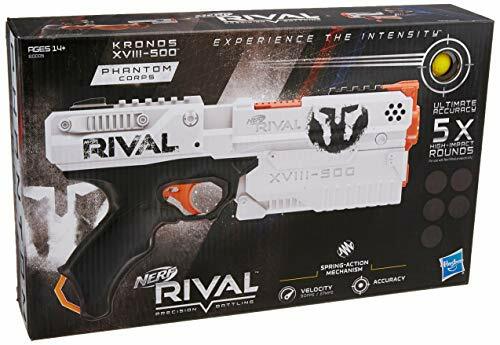 With a fully motorized feature, this Nerf Rival Nemesis toy fun provides kids with plenty of power to shoot with a lot of accuracy to hit their targets. Kids have been appreciating how precise this one is. We were impressed with how there’s a loading hopper included which makes reloading incredibly fast and easy. As a result, your little one is able to reload and stay in the battle for longer. It simply involves sliding the hopper open and putting the rounds inside in any order before closing it and being ready to shoot. It can hold up to 100 rounds, which means that kids have a lot of firepower. This is a powerful Nerf gun that allows kids to pull off shots with accuracy and speed. The loading hopper makes reloading a breeze. 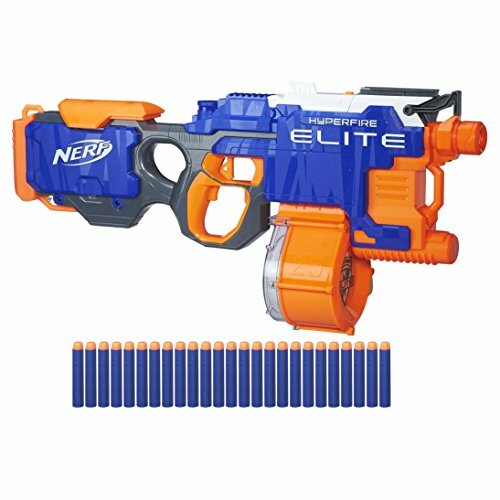 Kids have been loving how they can use this elite blaster to shoot up to 5 darts per second. This provides them with an incredible amount of pace to ensure that they can stay on top of their opponents. The drum that has been fitted features a capacity for 25 darts. Therefore, your child is able to have plenty of ammunition. These darts can also be fired at up to 90 feet, which is a fantastic range. The instructions that have been included are easy to follow. Parents have been liking this as it means that they can set up the blaster to let their kids start playing with it without delays. With the ability to fire 5 darts per second, this is a great option that lets kids shoot at a rapid pace when in close quarters. They can also shoot at longer ranges of 90 feet as well. This Nerf gun comes with an extension bipod that allows kids to expand the toy out to achieve longer range shots. There’s also a scope available that can be attached to help your little one shoot with more accuracy. 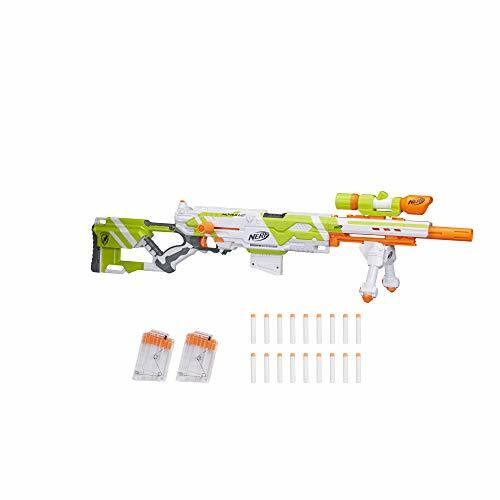 It comes with a total of 18 Nerf Modulus Elite darts and 3 6-dart clips. This provides children with plenty of ammunition to have an absolute blast with. Kids can load one clip into the blaster and keep the others stored in the shoulder stock. This is an awesome feature that allows for incredibly fast reloads. We liked how it has a bolt-action feature as it means kids need to pull a level back in between each shot, which they have a lot of fun with. Kids have been having a lot of fun with the bolt-action feature and how they’re able to perform super fast reloads. Children have the chance to shoot 6 darts at once as a result of the slam-fire blasting feature. This is an excellent feature for close quarters shooting as it lets your little one spread out their blaster shots to have a better chance of hitting the target. They can also pull of 6 quick-fire shots, one after another and be able to reach a maximum distance of 90 feet. We liked how the barrel has a rotating feature that allows for effortless reloading. There are also 6 darts included. We liked how the darts that are available are Official Nerf Elite darts as it means that they’re of a high-quality. Furthermore, they’ve been tried and tested to ensures that they reach the correct distances and remain durable. 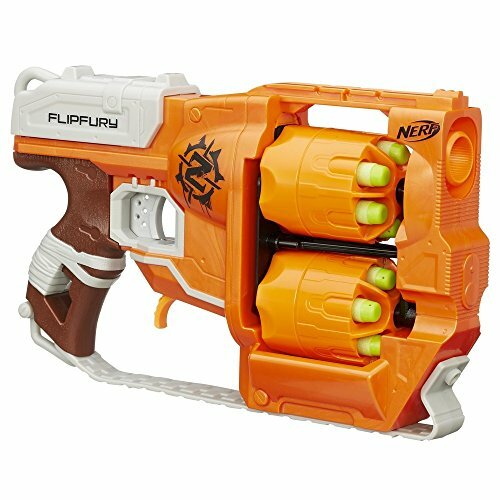 The barrel system means that kids can easily reload this one and be able to shoot all of the darts out at once with the slam-fire blaster. The Elite SurgeFire toy comes with an awesome rotating drum that allows kids to reload it with ease. It has a maximum capacity for 15 darts, which provided your little one with plenty of firepower. We liked how the darts included are able to travel at a maximum distance of up to 90 feet. This enables kids to pull off long range shots with a lot of accuracy. Children have also been having fun using the pump-action feature. It involves pumping the toy gun between each shot. Furthermore, a slam-fire blasting function has been included too. This lets children shoot multiple darts at the same time which is super exciting. 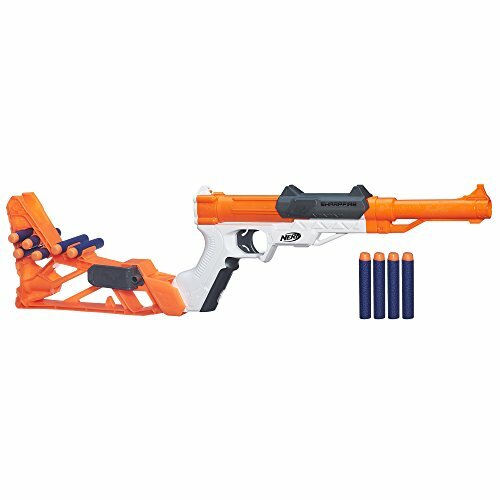 With the 15 dart capacity and slam-fire blaster, kids have a lot of ammunition power to have fun playing with. The advanced acceleration system that’s available with this Nerf toy gun allows kids to fire up to an impressive 8 rounds per second! So, if your little one is after something that enables them to shoot fast, this would be a great choice. It’s powered by a motor which comes with a battery that can be easily recharged. So, you don’t have to worry about the hassle of dealing with replacement batteries. Kids have also been liking how easy it is to reload this blaster. The hopper that has been included is effortless to reload and has a capacity of up to 200 Nerf Rival rounds. With this high capacity, your child is provided with a ton of firepower to have fun with. With the advanced acceleration system, kids can fire 8 rounds per second, which leaves their opponents with no chance! Children have been appreciating how easy it is to reload this one. This is a result of the built-in magazine that makes it a breeze to reload fast to help your little one stay in the game. It also has a high capacity of up to 60 rounds. Therefore, your child is provided with a lot of ammunition to have an absolute blast with. There’s a spring-action mechanism, which children love using when firing. They can fire the darts from this blaster at up to 100 feet, which means that they have a lot of range. Parents have also been liking how the instructions included are easy to follow. So, you can have this one set up and ready to go in no time. 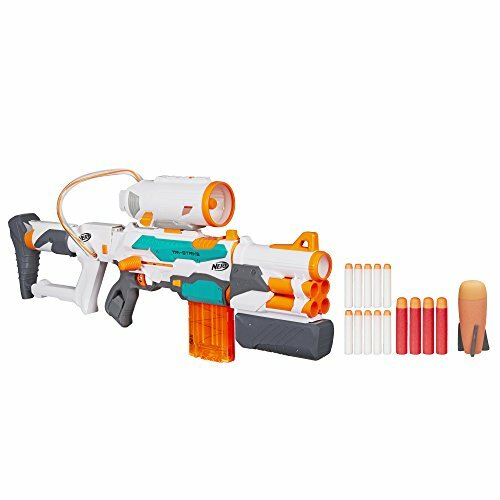 This Nerf gun has an effortless reloading system and allows kids to store up to 60 rounds to provide them with a lot of firepower. This Zombie Blaster comes with awesome whistler darts that children have been loving. It enables them to listen to the sound that the darts make as they whiz through the air. The zombie design of this one is fantastic for helping kids to play with more imagination. They love pretending that they’re using the blaster to fend off against a zombie invasion, which is excellent for their creative thinking skills. There’s also FireVision sports gear that glows when it’s thrown. This is a super fun feature that children love to play with in the dark. It provides them with a unique playing experience. Due to how this one has a zombie theme to it, kids are inspired to use it to play with a lot of creativity to keep themselves entertained for hours. 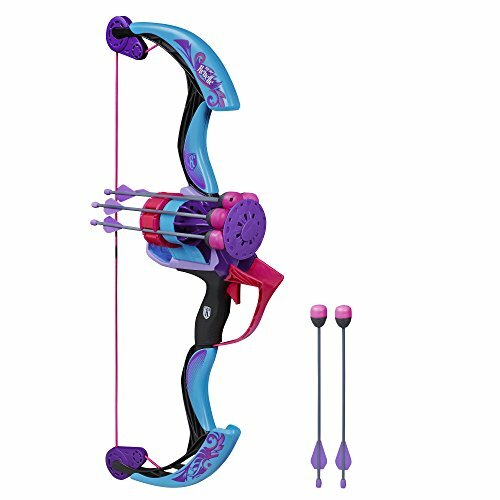 With a rotating drum that can hold 6 darts, kids are able to shoot at an incredibly rapid pace with a lot of smoothness. Therefore, this is a great option for children who are looking to play in tighter spaces. Having said that, it also has the ability to let kids shoot darts that can reach up to 90 feet! In addition to this, an excellent slam-fire action feature have been included too. This lets kids fire multiple darts at once. This set comes with 2 Nerf blasters and 12 Elite darts. Therefore, it’s awesome for 2 kids to play with together. So, it can be a great opportunity for your little one to improve their social skills. We liked how this one comes with 2 blasters and 6 Elite darts for each person. It provides children with a good chance to play together and work on their social skills. 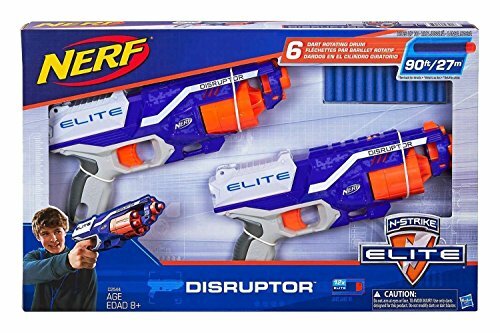 This Blaster comes with 3 Elite darts and 3 Mega Whistler darts. The whistler darts are a lot of fun for kids to use because they make a noise while they’re being shot through the air. Kids have been loving how they can fire 2 different darts with one gun. 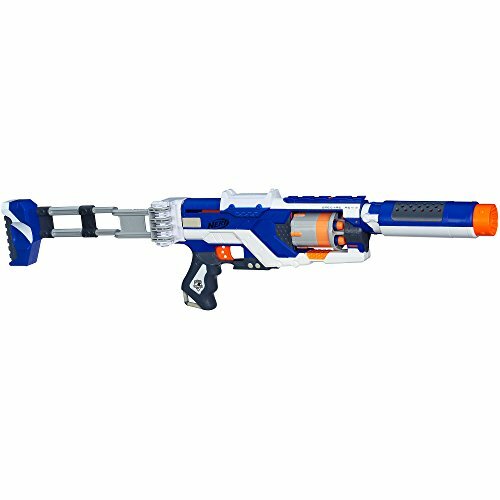 Children are able to use this blaster to shoot one dart at a time. Therefore, it may not be the best option for the faster pace games in smaller spaces. Parents have been glad to discover that the set of instructions that are included are super simple to understand. As a result, you can be sure to have this one ready to use within no time! Kids have been loving how they’re able to switch between 2 different types of darts at any time while playing. We were impressed with how this blaster is able to extend out to 41″ in length! This provides kids to go into battle at much longer ranges to hit their targets from a further distance. Children have been finding it incredibly easy to adjust the length of this one too. It simply involves sliding the barrel to extend it and sliding it back to retract it back to its normal size. It comes with 10 AccuStrike Nerf Mega darts that have been made out of high-quality materials. With 10 darts available, your little one is provided with plenty of firepower to take on their opponents. Children have been having fun with how easily they’re able to extend this blast out to hit their targets from a longer distance. This Nerf Rival Artemis model is available in a great blue color and comes with a maximum capacity for up to 30 rounds. Therefore, you can be sure that your child has all the firepower that they need. Due to the rotating barrel, kids are able to shoot the rounds out one after another with a lot of smoothness. We were also impressed with how they have included a slam-fire action feature. This lets kids fire multiple shots simultaneously, which can be a lot of fun. Parents have also been liking how there are easy to follow instructions available. These ensure that you can have the toy ready to use without any hassle. 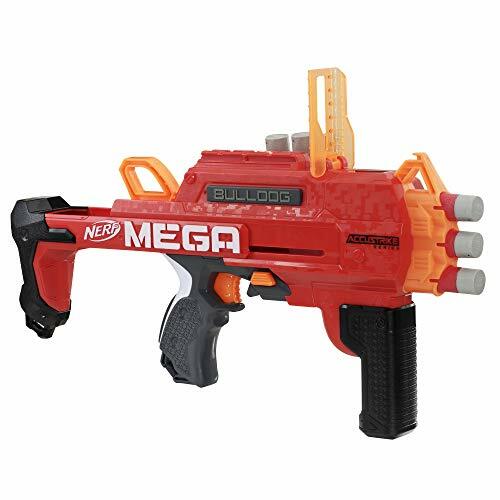 The slam-fire feature makes this blaster a lot of fun for children to use in close quarters situations. The Scravenger Nerf Gun has a fun zombie design that children have been loving. This design is excellent for encouraging kids to use their imagination while playing. There’s an awesome lever-action function which children have fun using while shooting the darts. Moreover, they’ve included a slam-fire feature which allow for multiple darts to be shot at the same time. We were also Impressed with how there’s a tactical light available, as well as a targeting scope for accuracy, and a barrel extension to achieve better range. With 26 darts available, your child has a lot to play with and keep themselves occupied for hours. Kids have been loving how they can use the scope and extendable barrel to get better range and accuracy. The zombie design is also awesome for inspiring them to play with more creativity. We liked how children are able to fire a maximum of 12 darts before they need to reload. This is an excellent feature that lets your little one pull off rapid shots without having to reload in between. The 2 drums that have been fitted are able to hold up to 6 darts each. Therefore, kids are always equipped with plenty of ammunition at the ready. This is particularly useful when they’re playing in smaller spaces. As soon as one of the drum goes empty, kids can switch to the other one to save time on having to reload. The instructions that are included are easy to follow and ensure that you can have the toy ready to use in no time. The switchable barrel feature is great for providing kids with a total of 12 darts that can be shot one after another, before needing to reload. This Brainsaw Blaster is part of the Nerf Zombie series which means it has a fantastic design. Children love using it to pretend that they’re in an apocalypse and fighting against zombies. It’s an excellent way for them to learn how to play with more creativity. We were impressed with how there’s a toy spinning saw blade available. It’s a unique design feature that children have been loving. There are also 8 foam darts available which children love shooting. Not to mention, the set of instructions that are available are straightforward. So, you can have this blaster up and running for your kids to use without any delays. 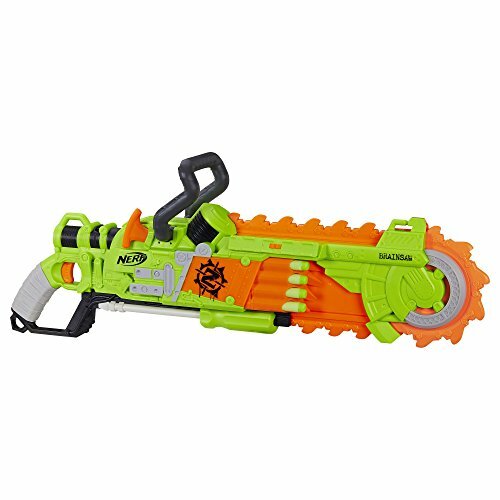 The pretend spinning saw blade and zombie design makes this Nerf blaster a lot of fun for kids to include in their pretend play games. As a result, their creative thinking skills are able to improve. 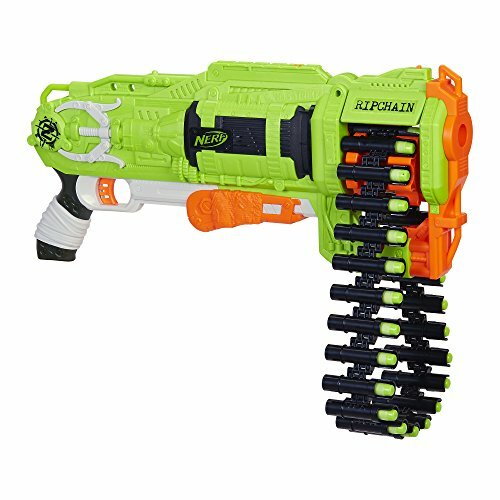 This is another Nerf Zombie blaster toy that comes with a total of 5 darts for kids to use. It allows kids to hold the blaster with one hand and shoot with ease, which is a fun feature that children have been enjoying. Due to the zombie design, kids also have a blast pretending like they’re facing off against zombies. As a result, you can expect them to use this blaster to play with a lot of imagination, which is great for their creative thinking skills. They’ve also made sure to use high-quality materials that are durable and safe for kids. Not to mention, the instructions that are included are easy to follow, which means you can have this blaster ready to use right away. Children have been loving how they can hold this blaster in one hand and play with creativity as they pretend to shoot at zombies. 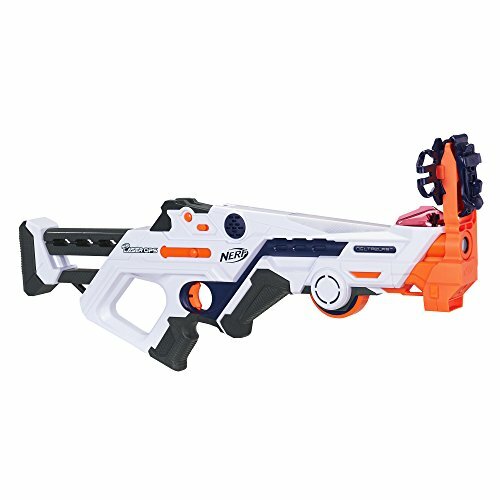 The Nerf Modulus Tri-Strike comes with a total of 3 different shooting options. It allows kids to use all of the different components at once, which includes the missile launcher and stock. Since kids have a number of shooting options available, you can be sure that they will have a blast using this one for hours on end to keep themselves entertained. It comes with a barrel extension too. This lets kids extend their blaster to achieve better range. In addition to his, there are 10 Elite darts and 4 Mega darts available. So, your little one has plenty of ammunition to have fun with. Children have been loving how they’re able to extend the barrel on this one and shoot their targets from further away. As a result of the fantastic rotating drum that has been fitted into this toy blaster, children are able to fire at a rapid pace. Therefore, it’s an excellent option for close range situations. Having said that, the Disruptor also has an impressive range of 90 feet. So, kids can use it to hit targets that are further away. They have also been having a lot of fun using the slam-fire feature. This allows your little one to fire multiple darts at the same time. The drum enables kids to shoot a total of 6 darts, which are all included with this set. We also liked how the set of instructions are easy to follow. With the rotating drum, kids are able to fire at their opponents with speed. They can also shoot multiple darts at the same time by using the slam-fire function. The Mega TwinShock allows your child to choose between 3 different shooting method. These include 1 dart, 2 darts at a time, and a slam-fire function. The slam-fire allows for more than 2 darts to be fired at the same time. With so many options available, your little one is able to select the best shooting method for the situation that they’re in. We were also impressed with how the darts can reach up to 85 feet. 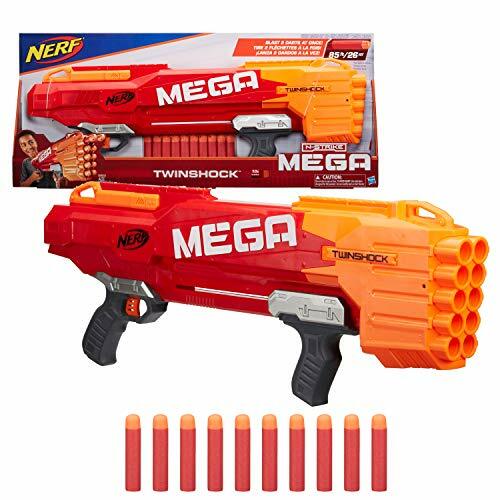 With 10 Nerf Mega darts included, kids have plenty of firepower to have fun with. The instructions are also simple which ensures that parents can have the blaster ready to use without any issues. With 3 shooting methods available, kids are able to shoot their opponents in the most suited way, no matter what situation that they’re in. We were impressed with how the Nerf Laser Ops Blaster comes with a range of light and sound effects. This makes it more exciting for kids to play with and is effective at improving their auditory and visual learning senses. The reload button that’s available is fast to allow games to have a fast pace. There are also indicators that let kids know about the status of their ammo, health, and team. Since this is a fun team game, children are able to improve their social skills while having fun. We also liked how kids are provided with an opportunity to customize their blaster, detect where enemies are, and keep track of their performance. These are all amazing features that make the playing experience more engaging. The range of indicators available let kids know about their health, teammates, ammo, and more! With the sound and light effects, your little one is able to have an immersive playing experience. This Kronos Outdoor Blaster comes with 5 high-impact rounds that allow kids to fire them at up to 90 feet. Therefore, kids can reach targets from a long distance and improve their accuracy. We liked how it has a spring-action function as it’s a lot of fun for children to use in between each of their shots. There are red and blue flags included as well which are great for group play. Kids can get each other in teams and set objectives of trying to get to different objectives and work together. This is an awesome way for your little one to improve their social skills and ability to work in teams. The spring action function is fun for children to use while shooting opponents. Moreover, the flags that are available encourage kids to play in groups and face off against each other. 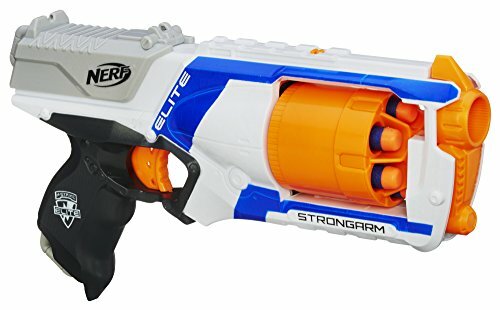 With room for 3 darts available to hold on the blaster itself, your child is always able to have extra ammunition ready to use if they ever run out. We also liked how children can easily change the length of this blaster. They can pull the grip downwards to extend the blaster and flip the sight up to get a better range and improved accuracy. Children are also given the option to retract the grip and flip the sight for closer range shots. There are also 6 AccuStrike Nerf Mega darts included which have been specifically made for accuracy. So, regardless of whether your little one is using the extended or retracted modes, you can be sure that they’ll be shooting with a lot of accuracy. Kids love having the option to choose between the retracted and extended blaster as it’s great for smaller spaces and pulling off long range shots. The Rival Hypnos is available in an exciting red color and comes with a folding stock. This enables kids to make it into a more compact size that’s awesome for close quarters shooting. They can then extend it back out for the longer range shots. There are 24 darts included with 2 12 round magazines that let kids carry them all to have tons of ammo and firepower. Children are able to shoot these darts out at up to 100 feet and with a lot of accuracy. They also have fun using the spring action function which they need to operate between each shot. We were impressed with how kids can fold this blaster down to be more compact and suitable for smaller spaces. They can then extend it back out for those long distance shots. 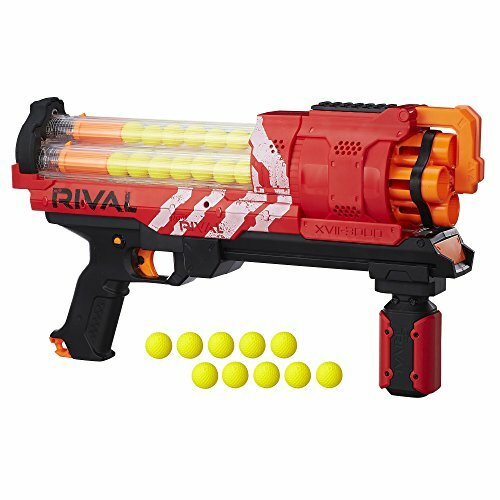 We liked how this Rival Artemis blaster is able to hold a total of 30 high-impact darts. This ensures that your little one is provided with plenty of firepower to stay on top of their opponents. The barrel has a rotating feature which means kids are able to shoot continuously without having to reload. In addition to this, a slam-fire feature has been included too. This lets kids shoot multiple darts at once. Not to mention, a built-in magazine holder is available. This makes loading the darts into the blaster a breeze. Parents have also been liking how the instructions are easy to follow. The impressive 30 round capacity ensures that your little one will always have a lot of ammunition to face off against their opponents. This Nerf Zombie Strike Doominator Blaster has an excellent design that helps kids to imagine that they’re fighting against zombies, which is great for their creative thinking skills. We also liked how it can fire up to 24 darts before it needs to be reloaded. This is a result of the 4 dart drums that can be flipped between each other as soon as one runs out of ammo. Each of the drums can hold 6 darts each. So, as soon as one drum is empty, kids can simply switch to the next and continue to fire. The instructions that are available are simple to follow too. Due to the 4 separate drums that can hold 6 darts each, kids can shoot up to 24 darts without having to reload. This Stealth Blaster has earned its name because it comes with a silencer that kids have been having an absolute blast using. It’s a great additional feature that improves the accuracy of shots. Children are also able to use this blaster in two different ways. The first one involves using it as a pistol-like toy which enables them to hold it in one hand. They can also use the other version by attaching the stock. By attaching the stock, the blaster is able to work more effectively as a rife. Children love having this freedom to interchange between the different styles, depending on the playing circumstances that they’re in. We liked how kids are given the option to use this as a pistol or a rifle blaster toy by adding and removing various attachments. 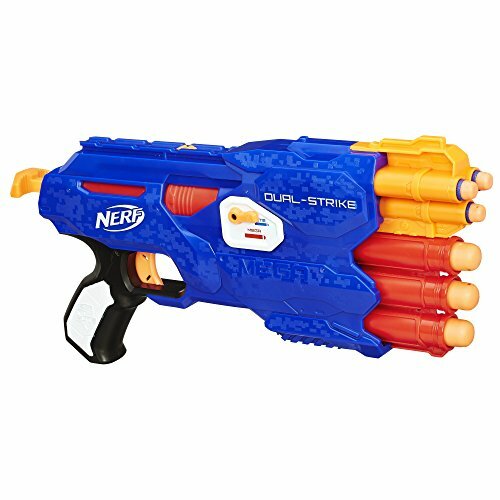 Children have been over the moon to discover that they can use this SharpFire Blaster in a range of 6 different ways. This is a result of the barrel extension and removable stock that are included. The barrel extension allows kids to extend the length of the blaster to be able to pull off more accurate long distance shots. They can also remove the stock and turn it into a more compact blaster. This compact option is awesome for smaller spaces. It also comes with 10 darts in total, which means kids have plenty of ammo. 6 of these darts can be stored on the blaster itself. With a range of 6 different blaster options available, this one is fantastic for catering to a range of playing styles that include long, medium, and short range. 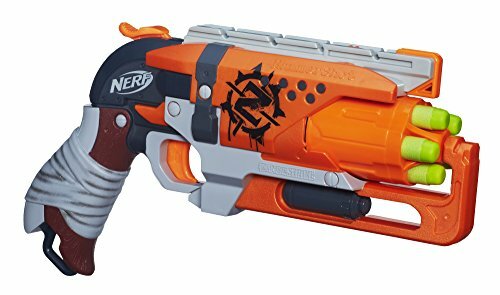 The Nerf Lawbringer Blaster comes with a range of 12 darts, which ensures that children have more than enough darts to go into battle with. We liked how the barrel has a rotating feature. This is because it allows your little one to shoot each dart one after another without needing to reload. As a result, they’re able to pull off some incredibly rapid fire shooting against their opponents. They can also store additional darts in the stock that comes with the blaster. Not to mention, the instructions that have been included are super easy to follow to have the blaster set up in no time. Children have been liking how they’re able to shoot at a fast pace with this one because of the rotating barrel design. We liked how this Modulus IonFire comes with a range of accessories that allow kids to get the most out of it in different playing situations. There’s a barrel extension available which lets kids lengthen their blaster. As a result, they’re able to shoot and reach targets from a further distance while maintaining the accuracy. There are also 2 removable dart holders available that let children store additional ammo. 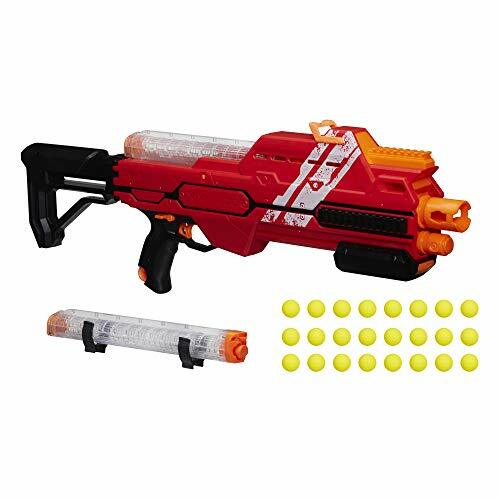 This blaster comes with 4 darts in total, which can be shot one at a time with precision. Parents have been glad to find that the instructions are simple and let them have the toy ready to use without any hassle. The barrel extension means that kids can convert this blaster to make it better for long range shots. They can then retract it back down where it’s best for close-distance shooting. 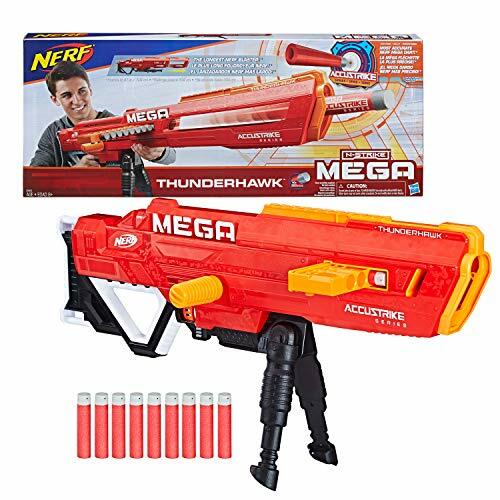 The white Nerf Blaster comes with awesome Mega Whistler darts that make a noise while flying through the air, which makes the experience more exciting for kids. We also liked how it has a zombie design too. This is because children have an absolute blast using it in their pretend play scenarios where they imagine fighting off a zombie invasion. As a result, you can expect their creative thinking skills to improve greatly. There is also FireVision sports gear included which light up when kids throw them. This is a super fun feature that’s a lot of fun to play with during the dark. The zombie theme is awesome for encouraging children to play with more imagination and keep themselves entertained for hours on end. If your little one is a fan of Star Wars, they’ll absolutely love this Star Wars themed blaster. It allows them to fire up to 3 darts in a row in rapid succession by using the pump-action mechanism. We were impressed with how it makes blasting sound effects. This makes for a more immersive playing experience and can stimulate your child’s auditory learning senses. 6 darts are included as well. There is also a targeting scope available which allow kids to shoot with a lot of accuracy. Furthermore, a GlowStrike technology feature is available which creates a light up effects that kids have been loving. Kids who love Star Wars love using this blaster, and all its sound and light effects, to play with imagination and role play their favorite scenes from the movies. So, that wraps up our review portion of what the best new Nerf guns have to offer. Now that you have a better idea of the kinds of features that these toys have to offer, you can start to zero in on the ones that stick out to you the most. However, if you’re still not completely sure, or you want some additional guidance, you’ll be glad to hear that this buyers guide section can help you out. If you were interested in how we chose the top options in our list and want to gather more information before making a final decision, take a look below. When it comes to Nerf Blaster toys, you may have some reservations about how safe they are. The section below will put you at ease as to why kids have been having so much fun with these toys, while also being safe. The blasters mentioned in this review are all designed for children. Therefore, the darts have been made out of foam and have hollow tips which allows kids to be free to run around and have a lot of fun with concern for injuring someone. They encourage your little one to engage in pretend play scenarios with friends and family. All Nerf guns have been made to help children have fun by pretending to shoot with toy blasters. So, if you were concerned about these blaster toys providing kids with a mixed message about real guns, you don’t have anything to worry about. They have enough power to let kids have fun, without too much to the point where they could cause any harm like real guns can. The Nerf guns that we’ve mentioned in this review are all either powered by batteries or are used manually. There is also a range of different types of blasters available. If you were interested to gain a better understanding of the differences between them all, the section below is for you. Nerf water guns are a ton of fun for children to play with outdoors in warmer weather with friends and family. They’re awesome for encouraging kids to play outside more often and exercise by running around. They’re also exciting to play with in groups, which can be effective at improving your little one’s social skills. Automatic Nerf machine guns are awesome for slightly older kids who are able to handle the faster firing rate. There tends to be smaller darts that allow for automatic shooting and large barrels to hold them all. We’ve included a number of Nerf mini guns in this review because they are awesome for close quarter situations. 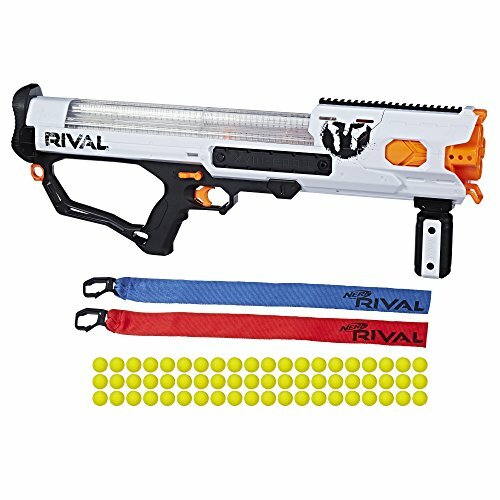 Kids love being able to hold these small nNerf guns with one hand and shoot with accuracy. Crossbows are an incredibly fun Nerf toy weapon that allows kids to play in a more unique way compared to blasters. Instead of squeezing a trigger, they can pull back the string and let go while taking aim. We liked how they actually use string to make the experience more fun! Sniper Nerf toys come with longer designs and a scope. This longer design allows for better range and the scope means that your child is able to shoot with plenty of accuracy. 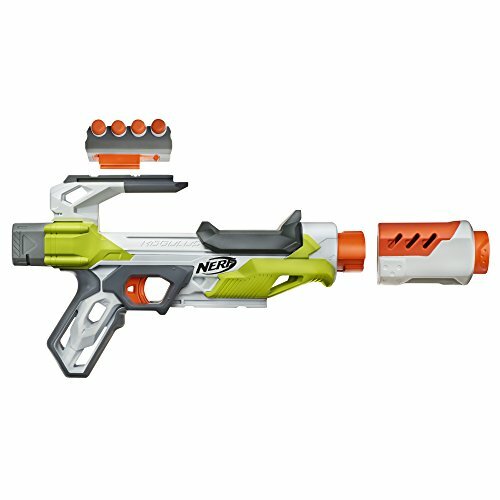 Are you wondering what some of the popular Nerf gun series that are currently available have to offer? With so many different series available, it can quickly become confusing trying to distinguish between them all. To gain a better idea of what makes the various series stand out from one another, take a look below. 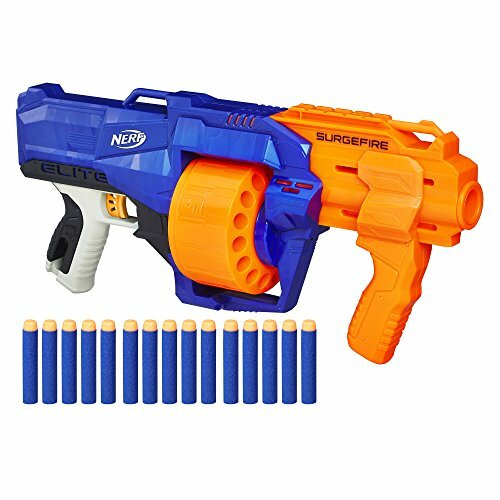 The N-Strike Mega range include some of the biggest Nerf guns which kids love using in larger groups. Therefore, these big Nerf guns are best for kids who want to be involved in large scale battles. If your after something that your little one can use to shoot with precision, something from the Elite range would be perfect. Not only are kids able to pull of incredibly accurate shots, they’re also able to shoot from a further distance. 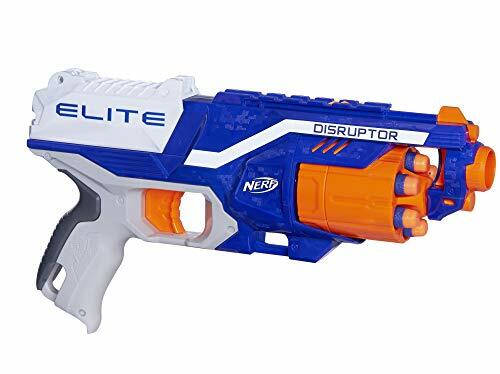 The N-Strike Modulus blasters enable children to customize their blaster to make it suitable for a range of playing styles. This Modulus system allows your child to try out over 1,000 combinations until they find the one that’s perfect for them. 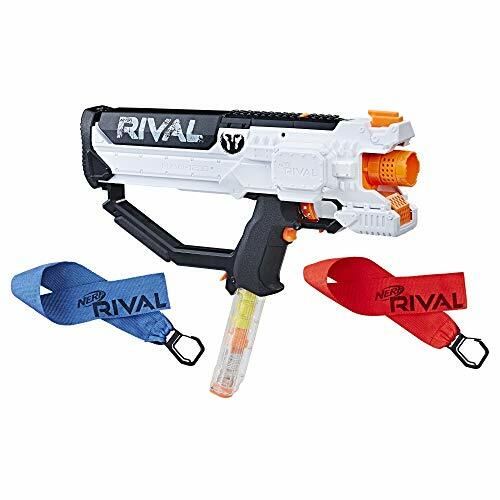 Rival blasters have an incredible amount of power that kids have been having a blast with. We also liked how the blasters in this range allow kids to shoot with a remarkable amount of precision. Zombie Strike Nerf guns come with inventive features, such as toy spinning saw blades, that kids have an absolute blast using. They’re able to use their creative thinking abilities to role play being in a zombie apocalypse and keep themselves entertained for hours. If your child is a fan of the popular Overwatch game, they will love using the Rival Overwatch range. 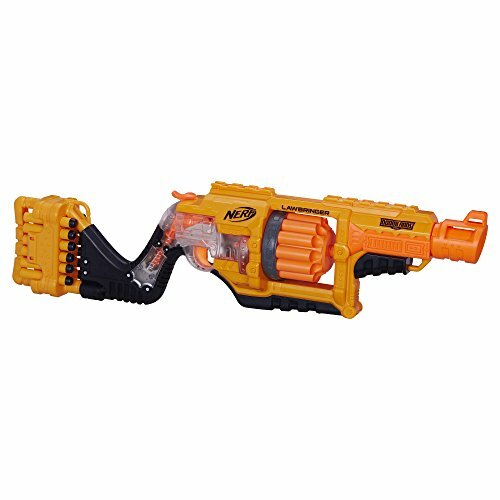 The blasters in this series have been designed to look similar to the ones in the games, which means kids can use them to role play and have a ton of fun. The Laser Ops Pro range provides kids with responsive blasters that come with fantastic light and sound effects that make for an immersive playing experience. They are awesome for playing in groups against each other, which is great for your little one’s social skills. Nerf Super Soakers are incredibly fun for kids to play in small groups with others. We like how they encourage children to play outdoors and with others often. The Nitro range involves firing cars from mini blasters and watching how they zoom ahead onto the selection of different ramps that are available. Children who love Star Wars have been having a lot of fun playing with the Star Wars themed Nerf blasters. This is because they can use them to role play scenes from the movies, which is fantastic for their creative thinking skills. 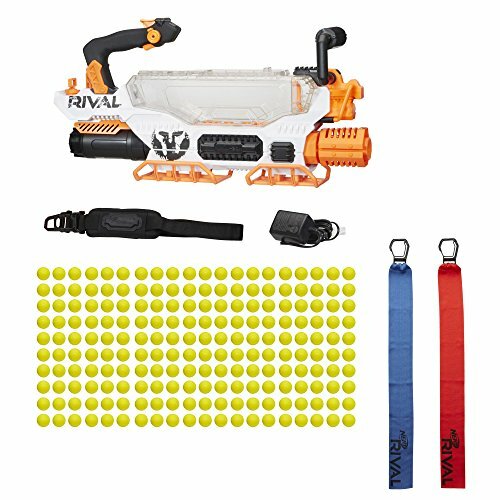 When it comes to these Nerf guns, there are different balls, discs, and darts available that can easily go missing. It’s also likely that they’ll become damaged and need replacing after some time. Therefore, we recommend that you stock up with some extra ammunition so that you can be sure that your little one will never be running low. Be sure to check what specific type of ammo your child’s blaster uses as there are a number of different types available. After kids have been playing with their Nerf guns for some time, they may want to have some additional upgrades. To learn a little more about what some of the best attachments and accessories have to offer, take a look at this section. There is a range of Nerf gun scopes available which kids love using as attachments. They’re able to put them onto their blaster with ease and be able to have more accurate aim. Some of the Nerf guns mentioned in our review come with clips, however, not all of them do. These can prove handy for kids who want to have as much ammunition on them as possible to allow for quicker reloads. The clips are great for enabling your little one to effortlessly carry more ammo and take them off the clip if they ever run out. If you’ve been searching for Nerf guns, you will have seen that there are also tactical vests available. These vests provide kids with some body protection if you’re worried about the hollow tips hurting them. However, they’re also great for enabling kids to carry additional ammunition and other accessories, such as scopes. Outside of their guns Nerf also has a bunch of cool Nerf Swords that are quite popular among little kids. If you have a child who loves swords these sword toys are a great option to consider. 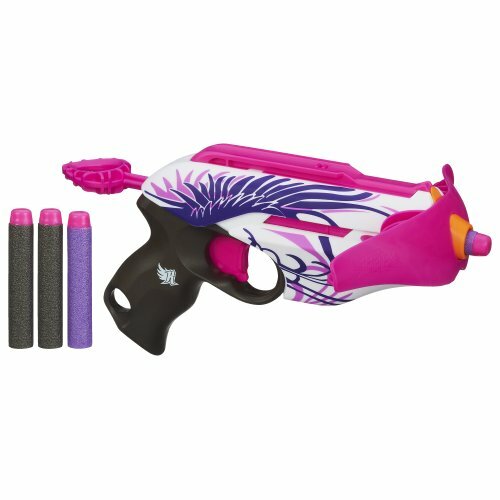 Below we have listed several some fantastic Nerf guns for girls that are available in pink colors. These brightly colored pink options may be more appealing for girls to use and can encourages them to use Nerf guns to play in groups. 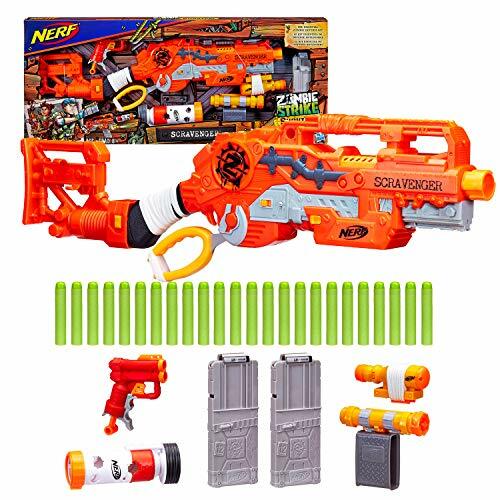 Now that you’re armed with more information about what to expect from the top Nerf guns, you can be sure to find the one that you think your little one would enjoy playing with the most. Be sure to read through the main features, pros, cons, age recommendations, and what makes each one stand out. Our buyers guide section includes even more information to help you feel more assured about how these toys are both fun and safe for kids.